Visiting museum make you happier, it true. 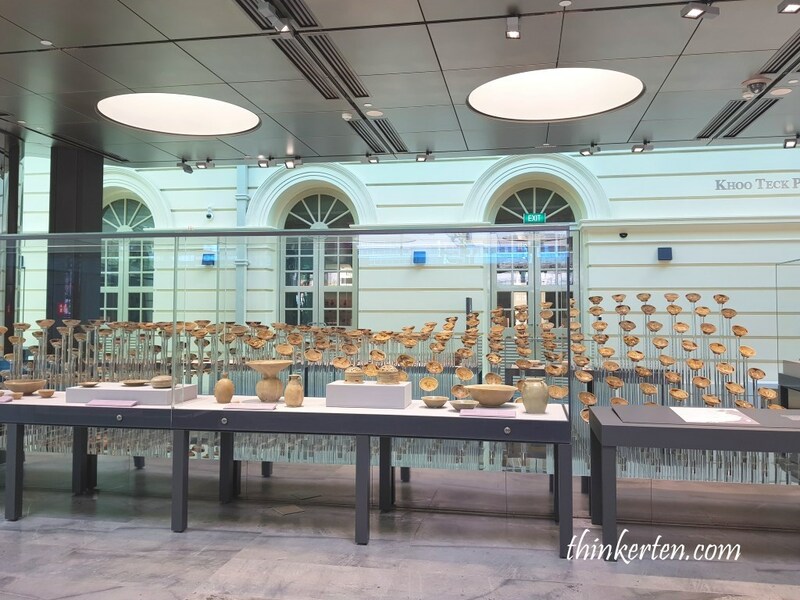 In the museum you found interesting history and also it offer a dynamic opportunity to expose us to experiences and explore new things. 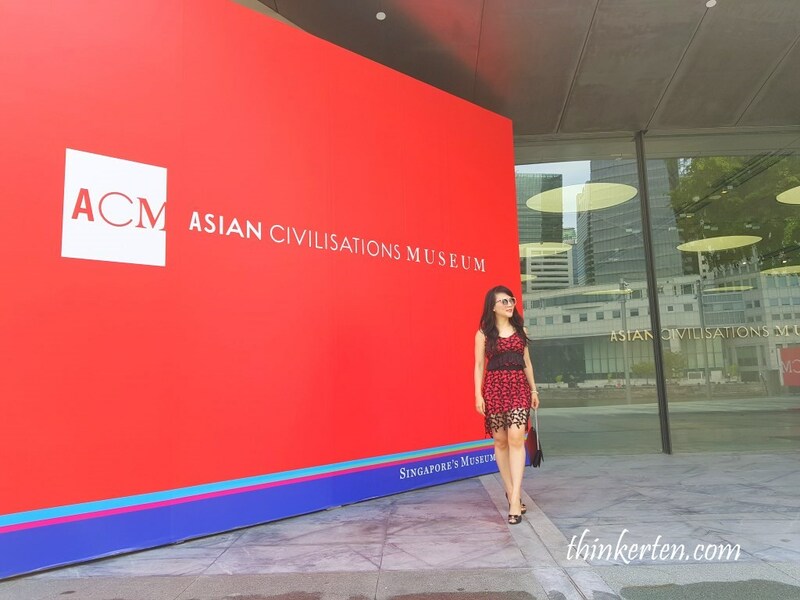 Museum is not just about the past, it also a place for us to see the future. 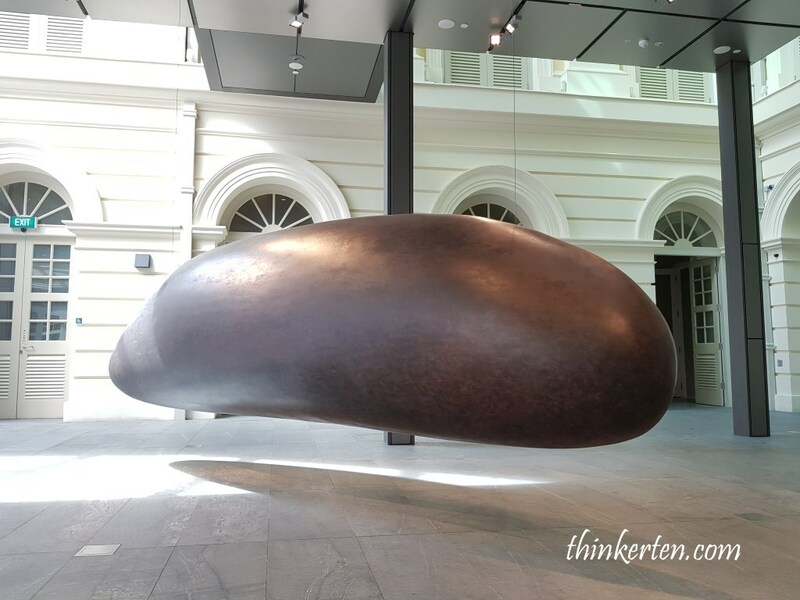 I love being in the museums as museums open up a world of imagination and exploration. 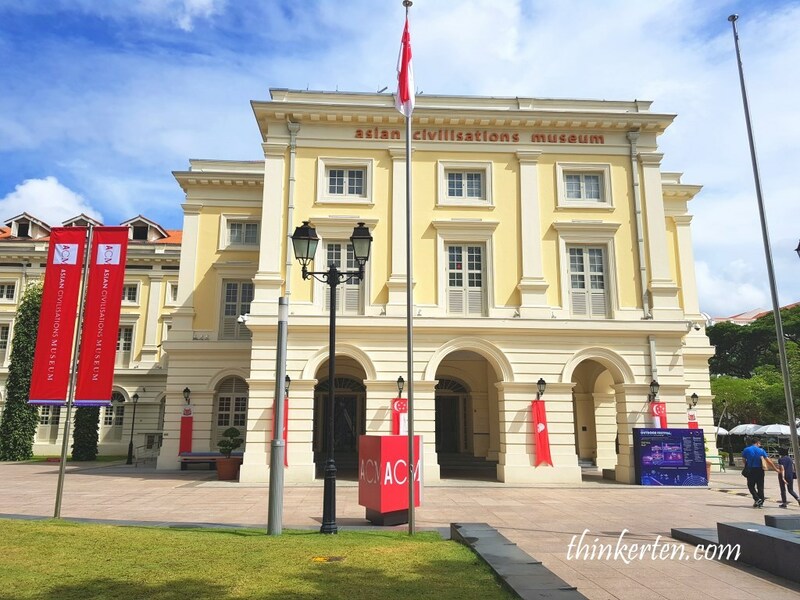 I was here at the Asian Civilization Museum early in the morning of the NDP day. 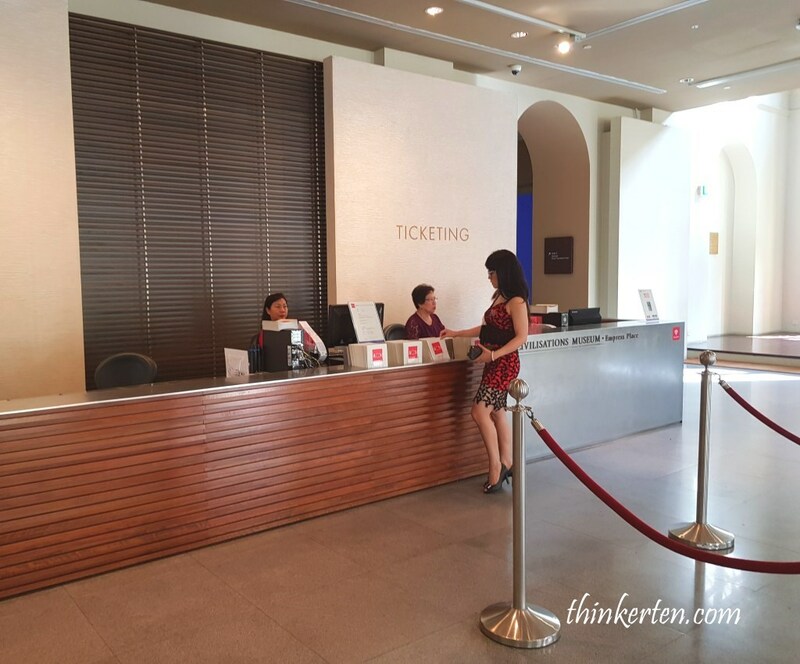 Few groups of tourists from China and Japan has already gathered at the main entrance of Khoo Teck Puat Gallery. 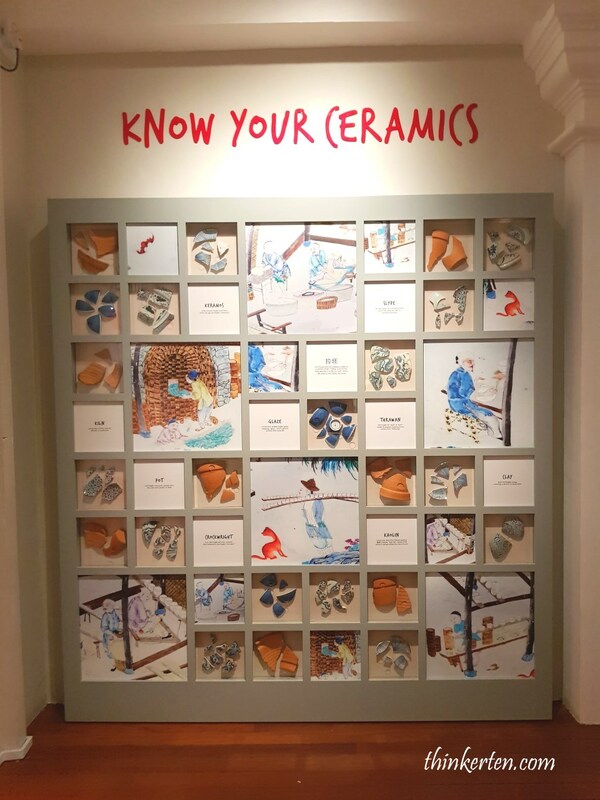 If you love porcelain, you would be love this place. 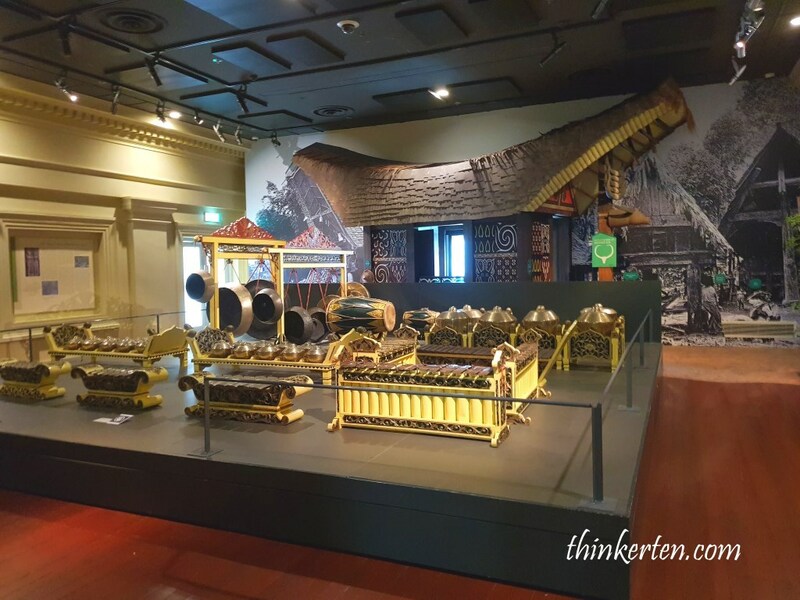 Belitung shipwreck also known as Tang shipwreck is placed here at the Asian Civilization Museum now. 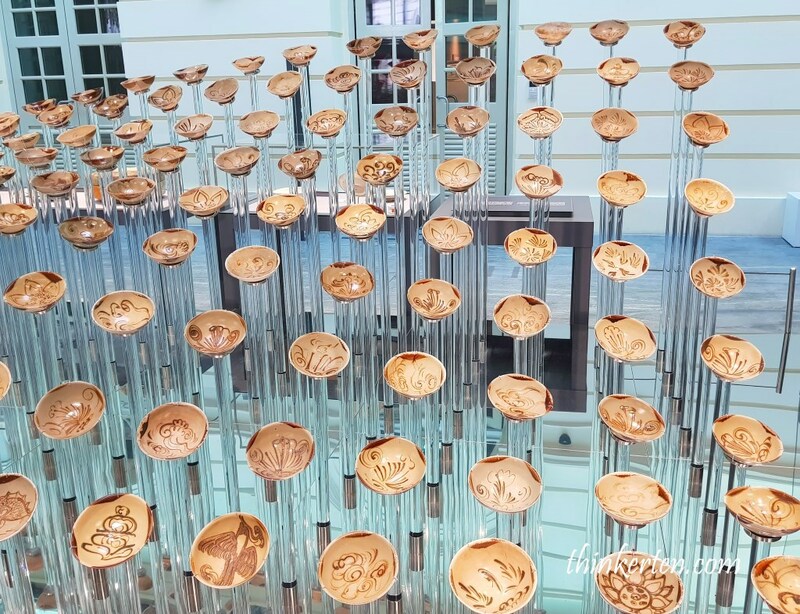 The exhibition first made it debut at ArtScience Museum in Singapore for few months, then the exhibition traveled around the world for five years and now finally here at ASM Khoo Teck Puat Gallery. 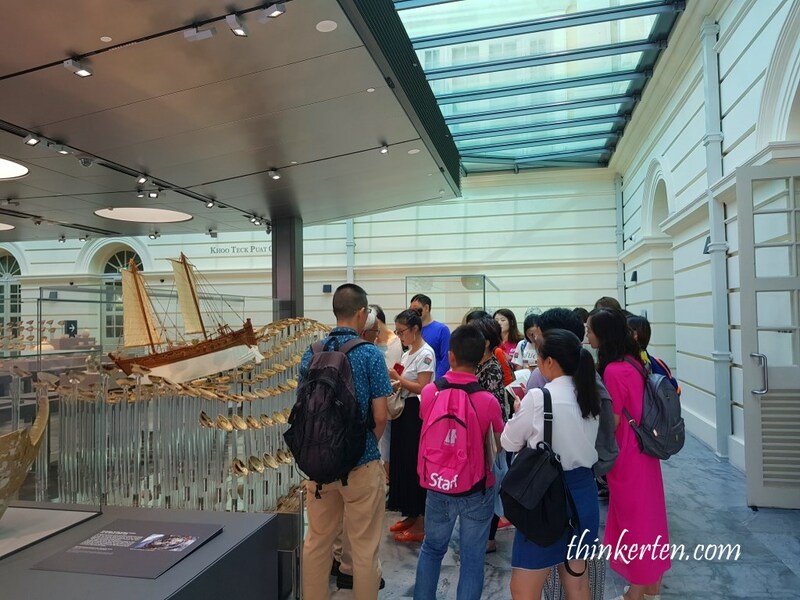 The famous 9th century shipwreck has the biggest collection of Tang dynasty artifacts. 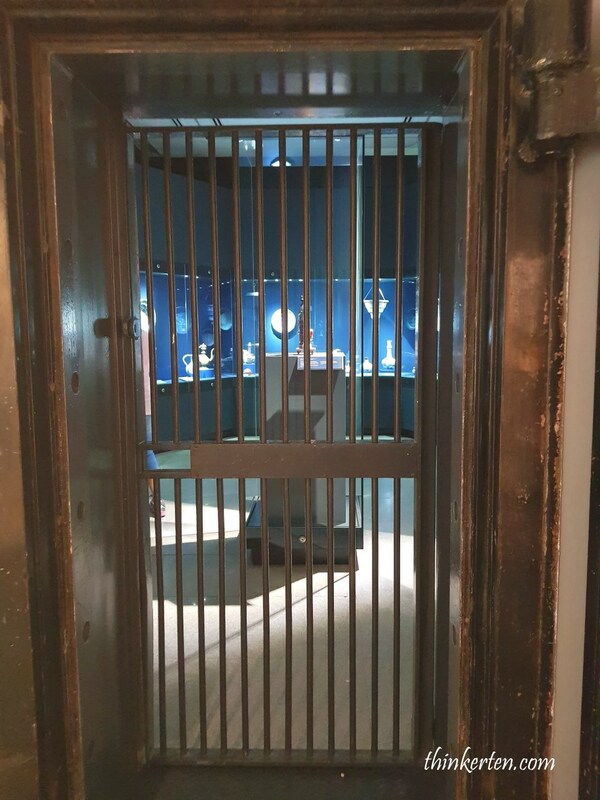 The shipwreck was discovered in 1998 by an Indonesian fisherman, about 60,000 of artifacts including ceramics produced in China during the Tang Dynasty (618-907) plus many other gold and silver artifacts. 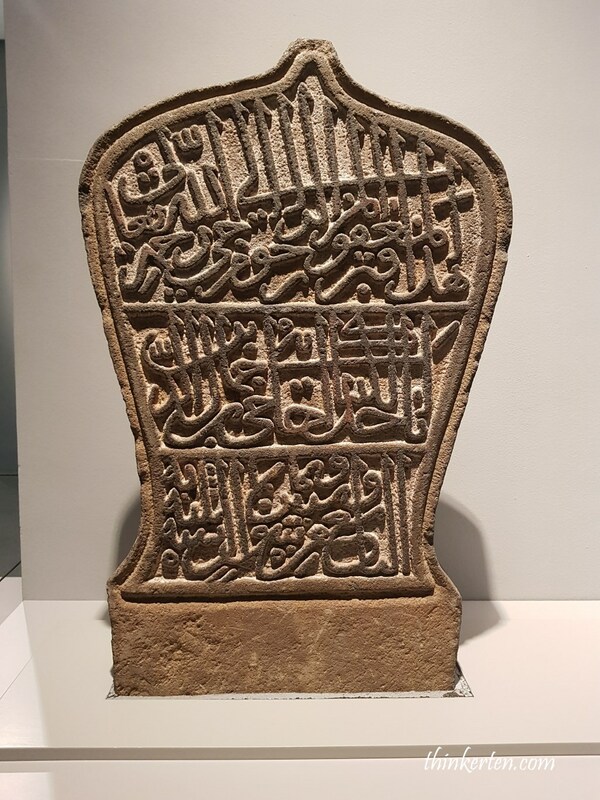 Artifacts from Iran and Iraq were also found so it provides proof for the strong commercial links between China, SEA and the Middle East. Ceramics were made from Changsha, Hunan Province. 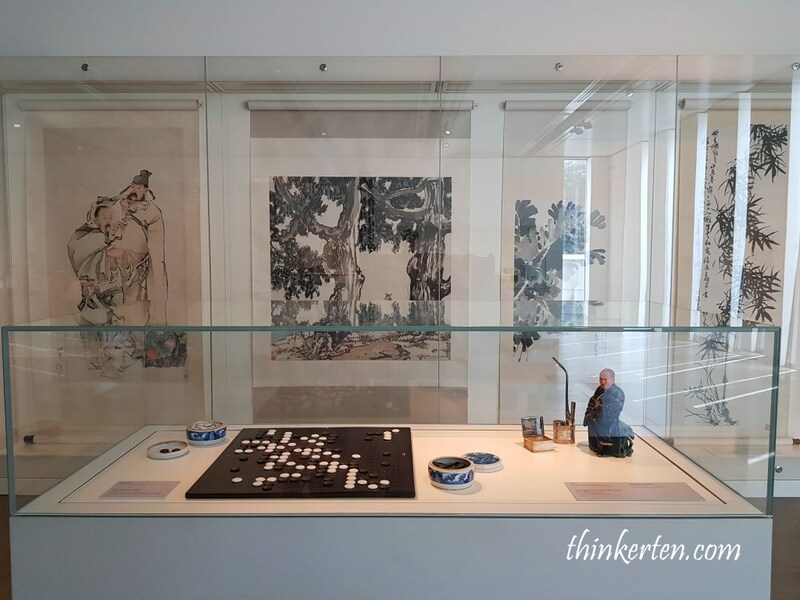 In this exhibition, you can take a closer look at the high quality ceramic pieces used as daily household wares back in the Tang Dynasty. The majority of the bowls are decorated on the interior with copper green and iron brown. Kraak is a dutch word, it is the first Chinese export ware to arrive in Europe in mass quantities. Kraak ware is normally all painted in cobalt blue style. This is an interesting artifacts, as the head of the boar is removable. It meant to help to keep the dish warm. If the dish is just cooked and still very hot, there will be hot steam coming out from the nostrils. Quite cool right, especially it also has a matching plate when serve on the table. 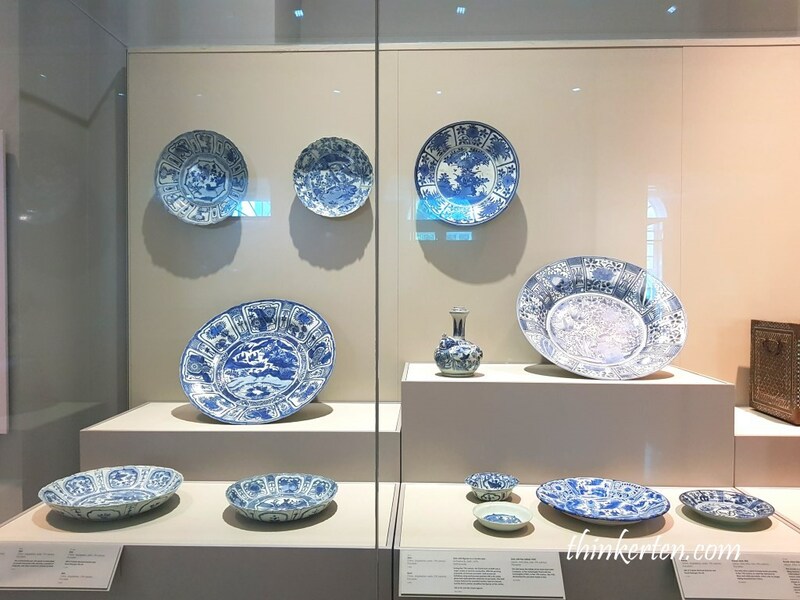 In China when you heard about Jingdezhen then you will associate with it porcelain. 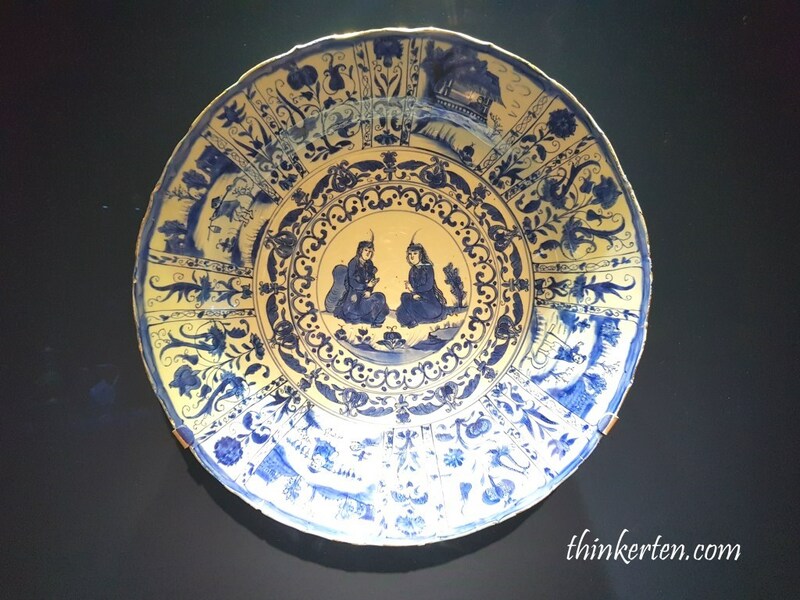 Jingdezhen produced most of it wares during the Tang Dynasty (618-907). I love how it has the gold touch at the top, bottom and side. 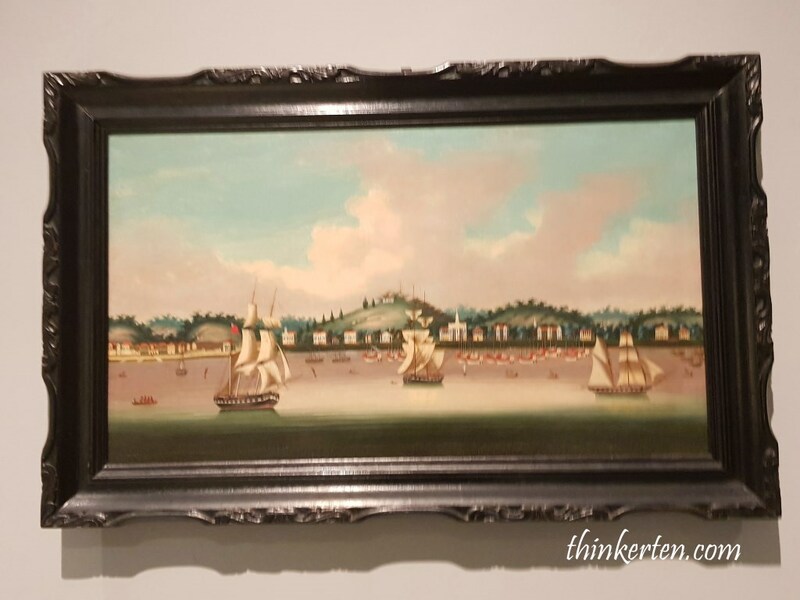 Three European ships dominate the foreground of this view of Singapore’s harbour. 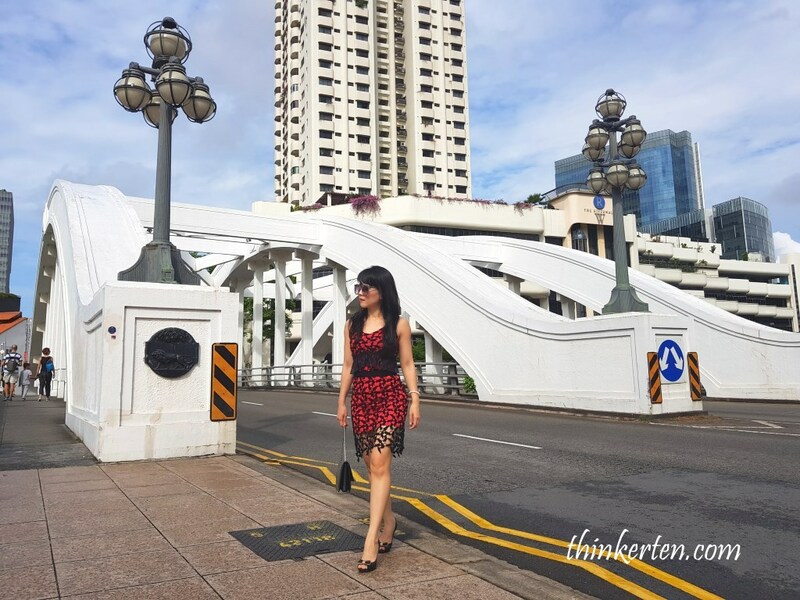 Behind the warehouses are landmarks such as St Andrew’s Cathedral and Fort Canning. 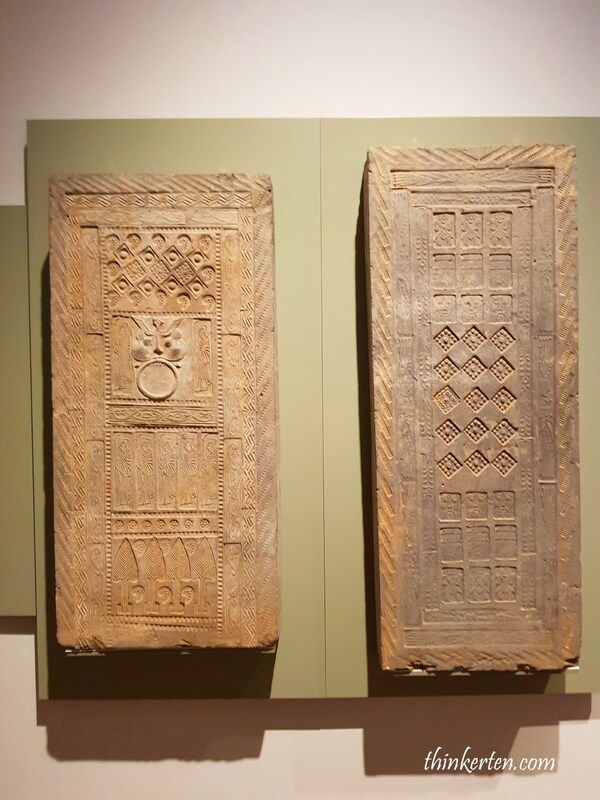 Tortoiseshell cabinet has 11 drawers and pay special attention to the four legs, it has a lion’s heads and it the centre with a head of a bearded man. Such cabinet is produced for the European market and a mix craftsmanship of Indian and European form. 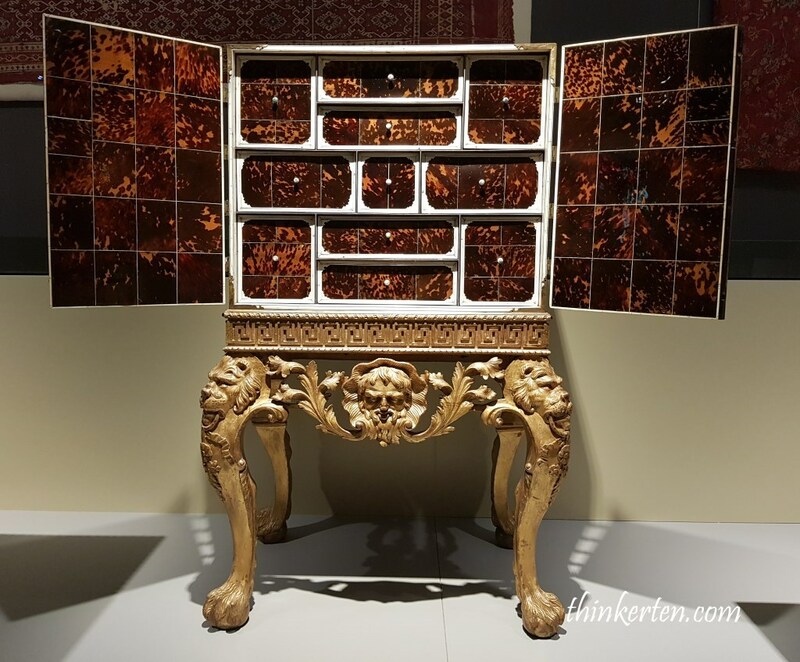 Imagine putting all your necklaces, bangles, rings and watches in this turoiseshell cabinet. 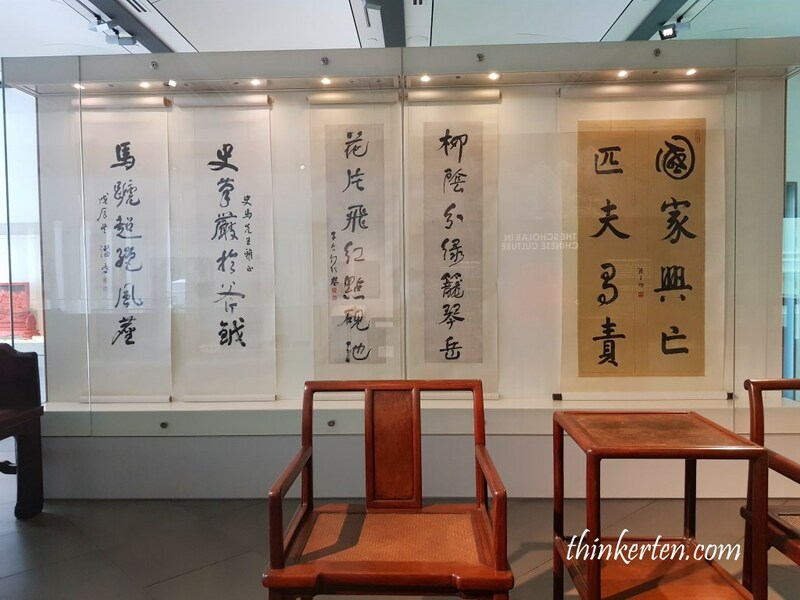 Check out the calligraphy here. In Japanese, they called it Igo. Originally it is from China 2,000-4,000 years ago but now it is still very popular in Japan. Feeling tired after the long walk? 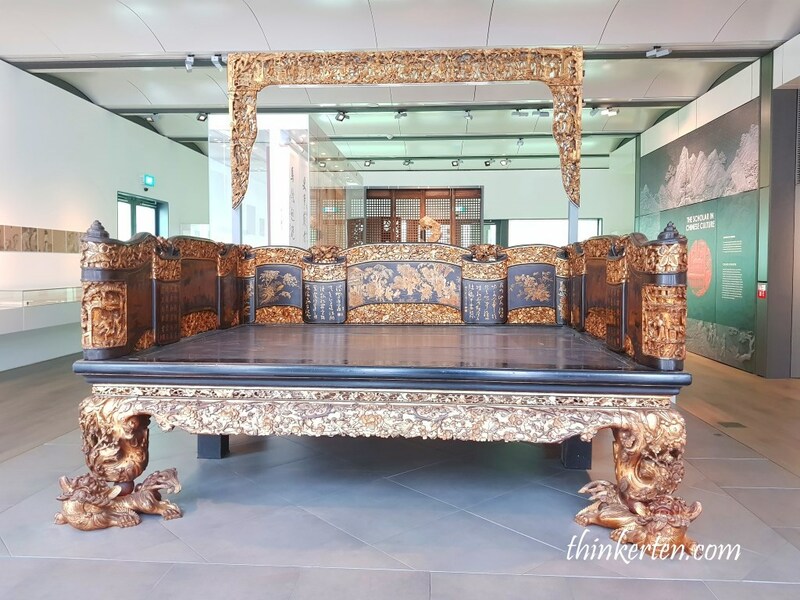 You may want to try to “imagine” sleeping on this dragon bed. In Xi’an, you get to see the giant size or real size of the terracotta army, over here the terracotta army are mini size. Different Kings has different preference in preparing their afterlife terracotta army and personal ornaments. When I was in Shaanxi China, I saw exactly same figure in Yangling Mousoleum of Emperor Jing from Han Dynasty. Check out the chubby woman in Tang Dynasty. 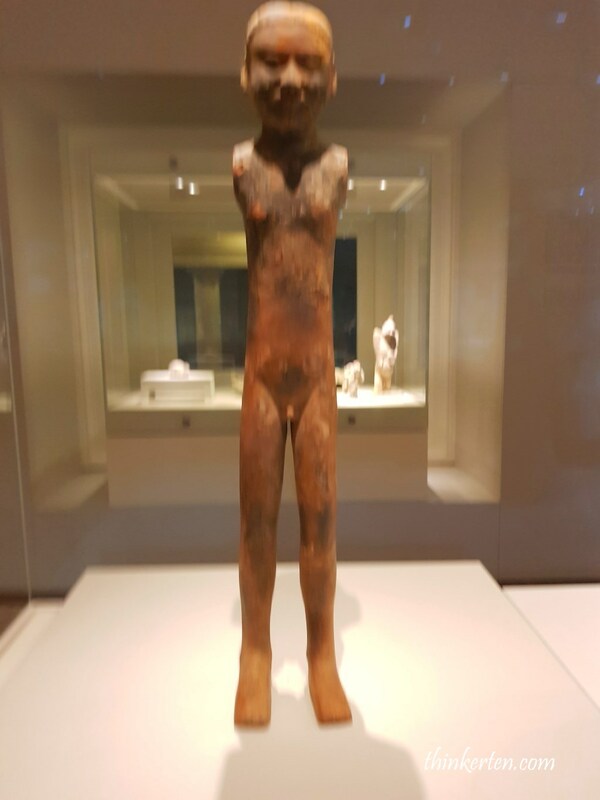 We think she is chubby or fat but during Tang Dynasty, this is the perfect size for a woman. A dream body! The King at that time only love women who are meaty and chubby. I guess women during that period should be happy and can eat all their want and don’t have to watch their weight 🙂 One of the Four Beauties that lived during Tang was Yang Guifei, and she was described to be quite plump and round. 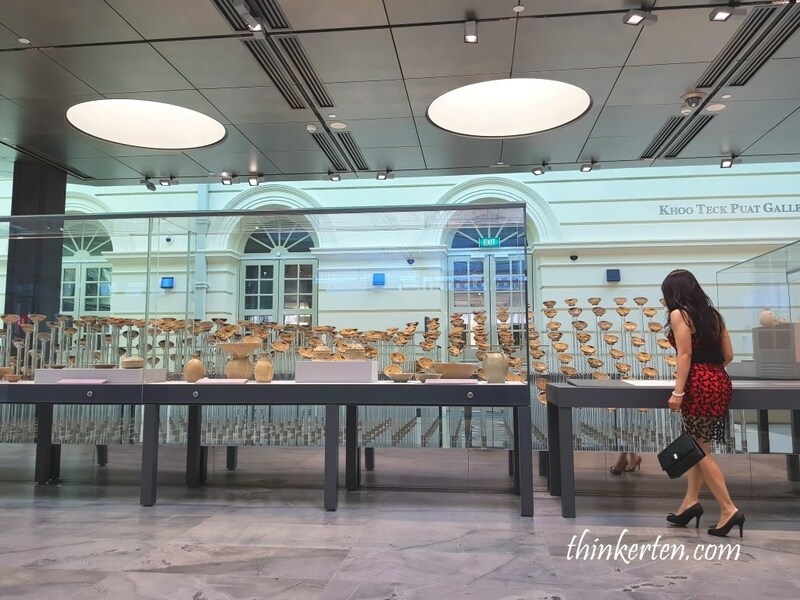 There is a corner to learn about ceramics from different timing and dynasty. This corner is definitely great for children. 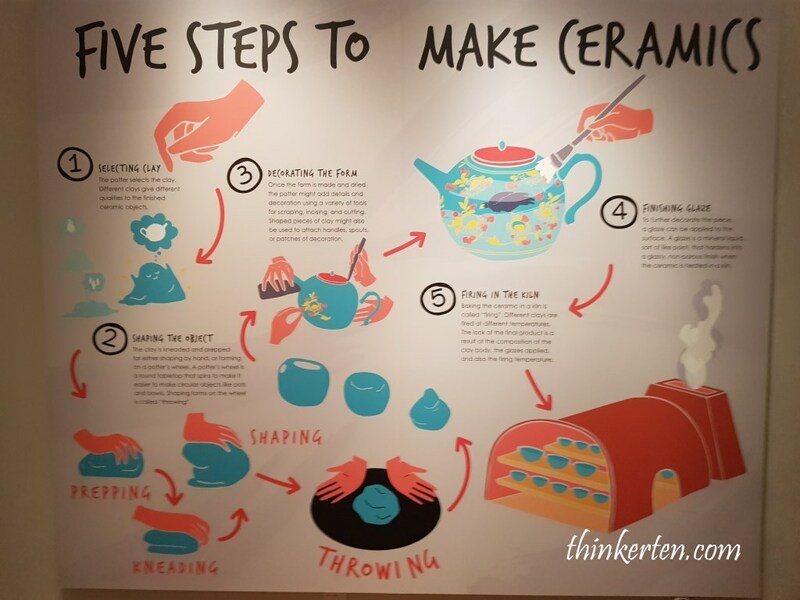 Too bad there isn’t a real hands on corner for the kids to play with the ceramics. 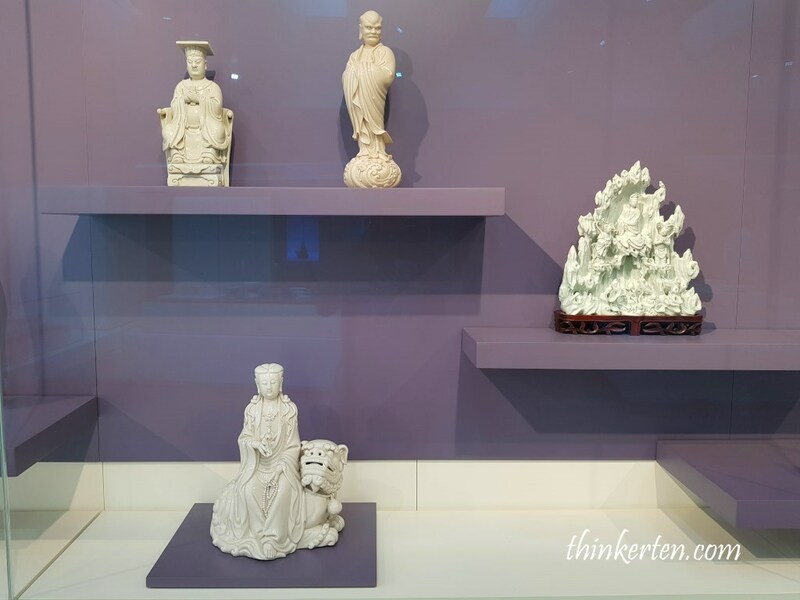 Dehua porcelain is originally from Fujian province. It is usually in white color series but some are in green. 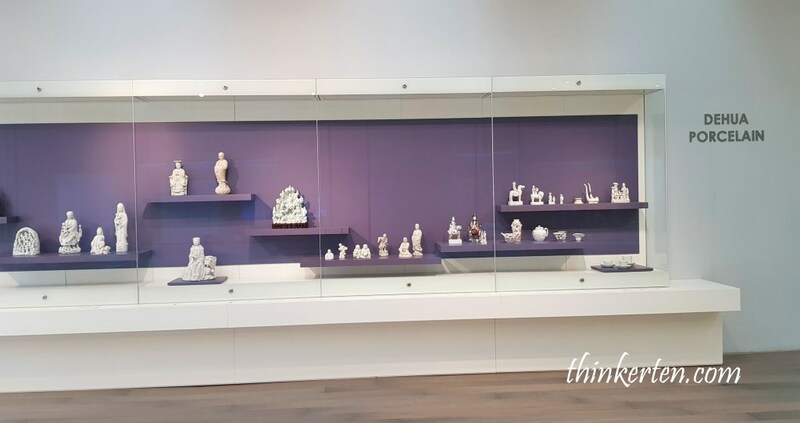 Asian Civilization Museum has quite a big range of Dehua porcelain collection. 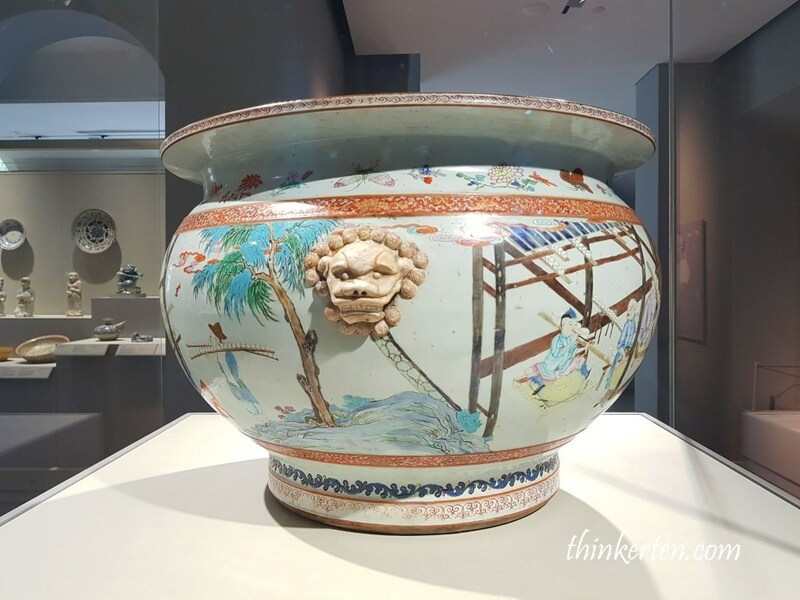 Dehua porcelain started in the Ming Dynasty (1368-1644). It is famous for it white color series and many are in the form of Buddha statues. 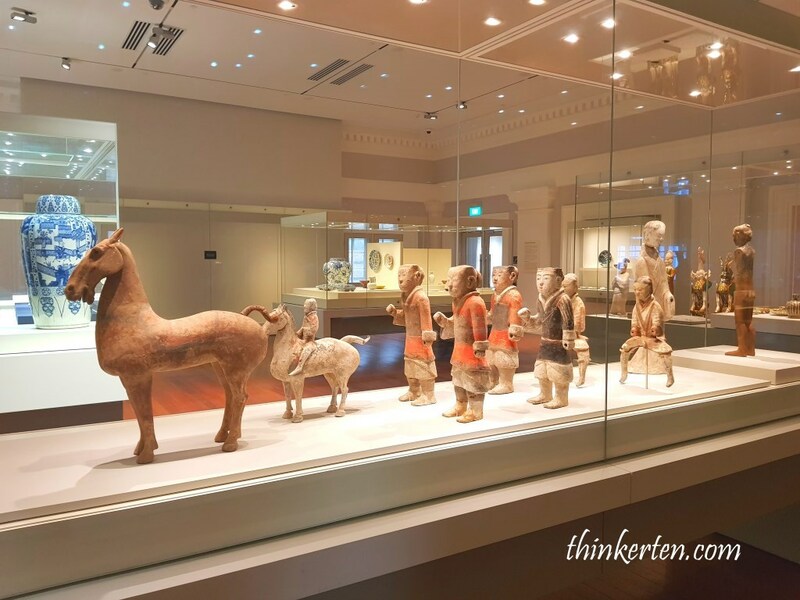 Many of the Dehua Buddha statues were exported to Japan from Fujian China for the Japanese family alters so there is a very huge deman in Japan for Dehua porcelain. 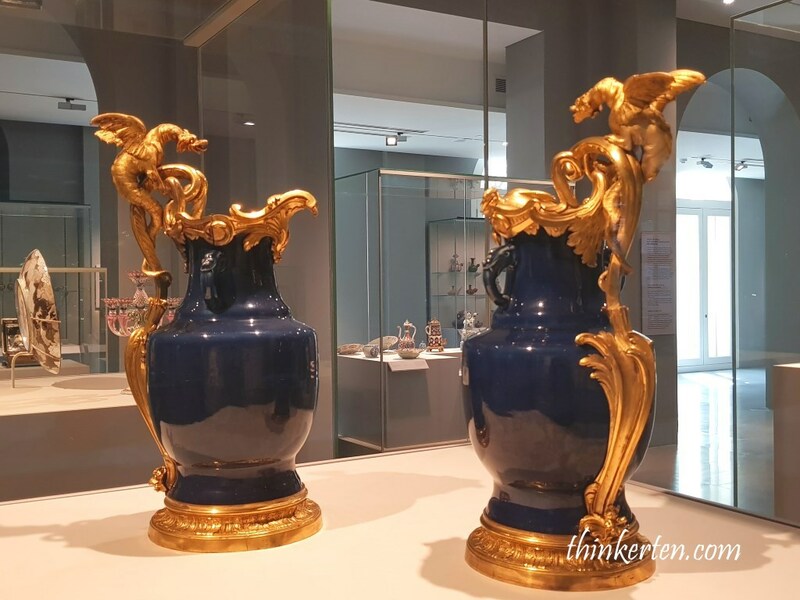 The French also love Dehua porcelain and called them “Blanc de Chine” ware. 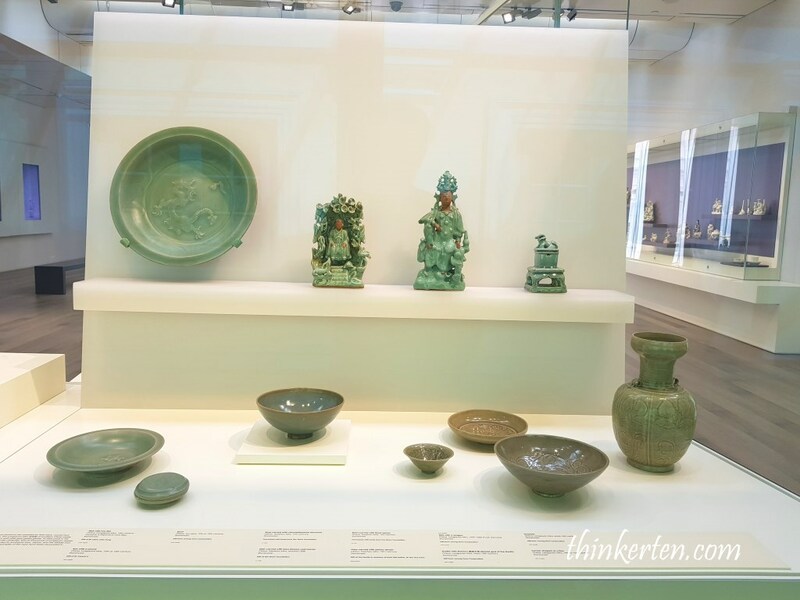 There are also some green series of Dehua porcelain but the white series is more famous. 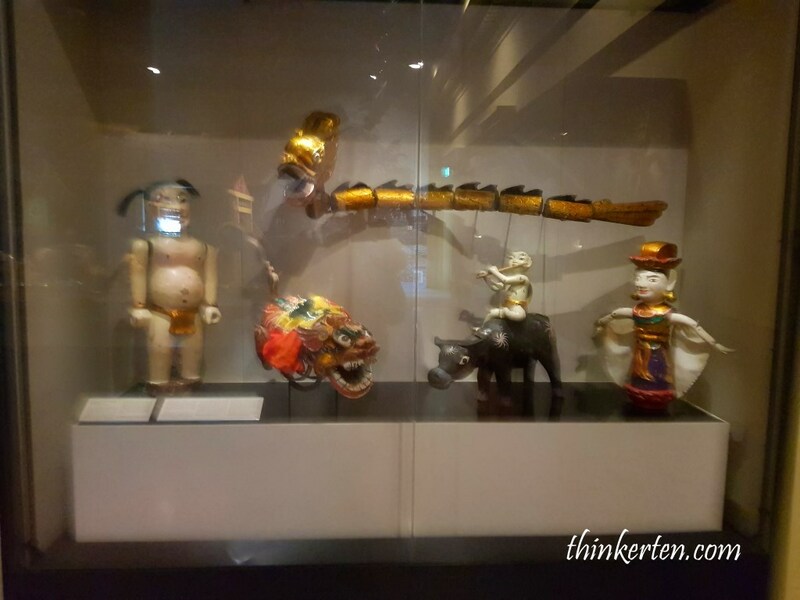 The lights in this exhibition hall is quite dim, it has the artifacts from South East Asia. You will find many familiar music instruments, puppets and masks for performances used. 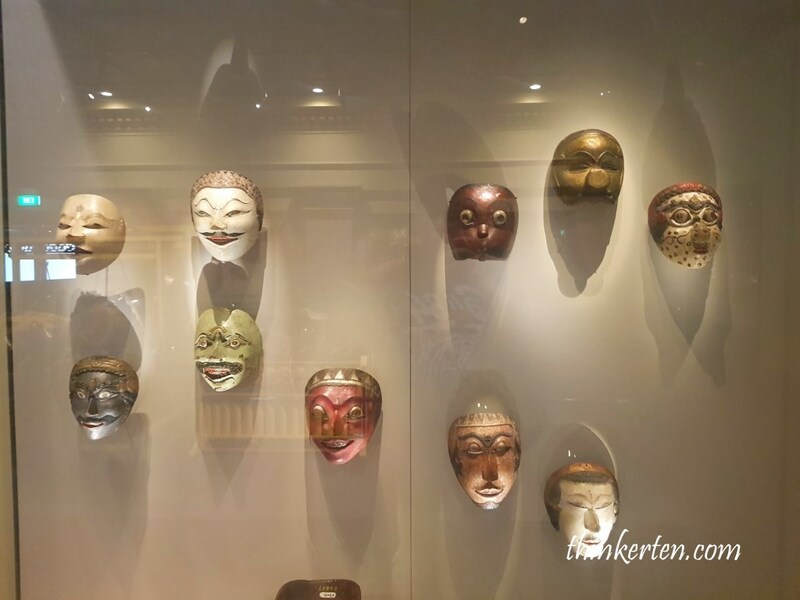 Different kind of masks displayed, which do you prefer to wear? 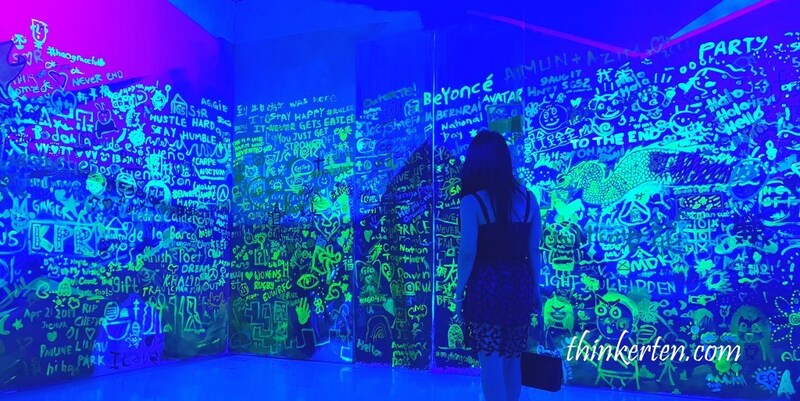 I guess this room is for the people to express themselves. 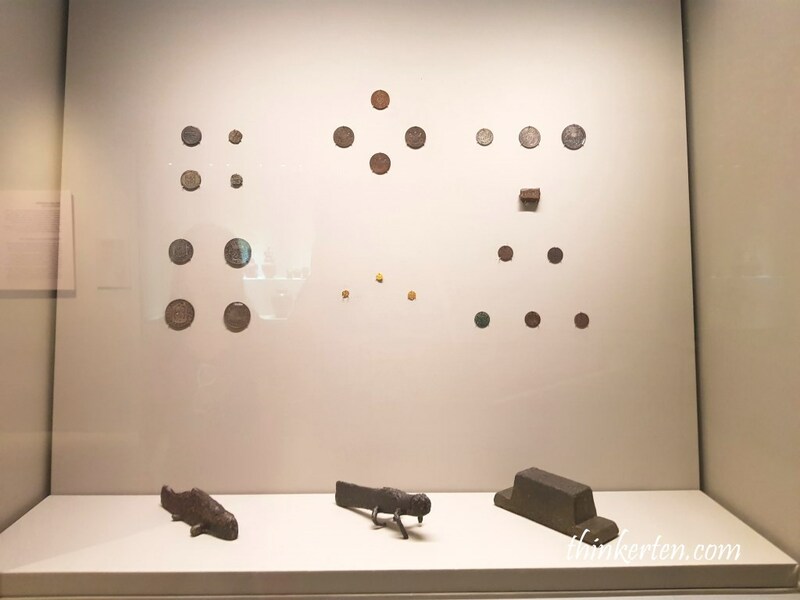 You can see different type of coins used by Dutch, English, Chinese, Javanese and Spanish. 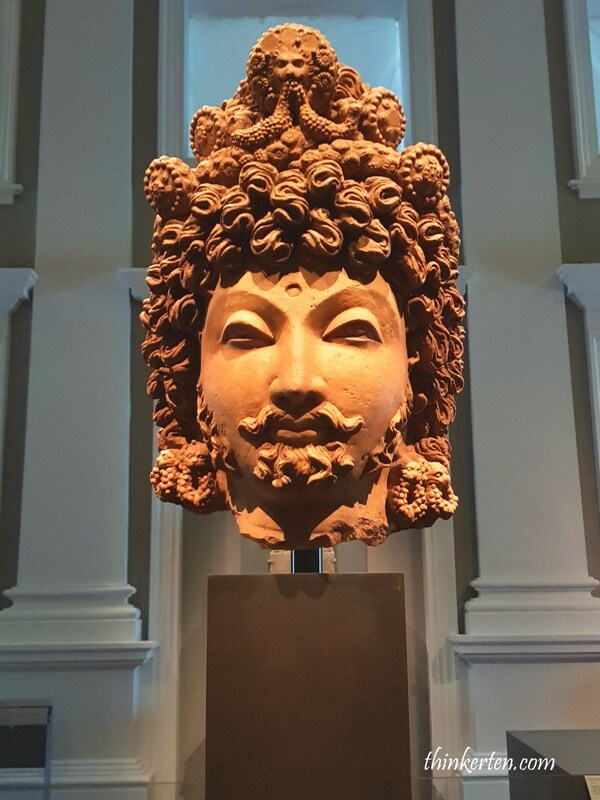 Do you find the Persian man look like “sun wu kong”/孙悟空? 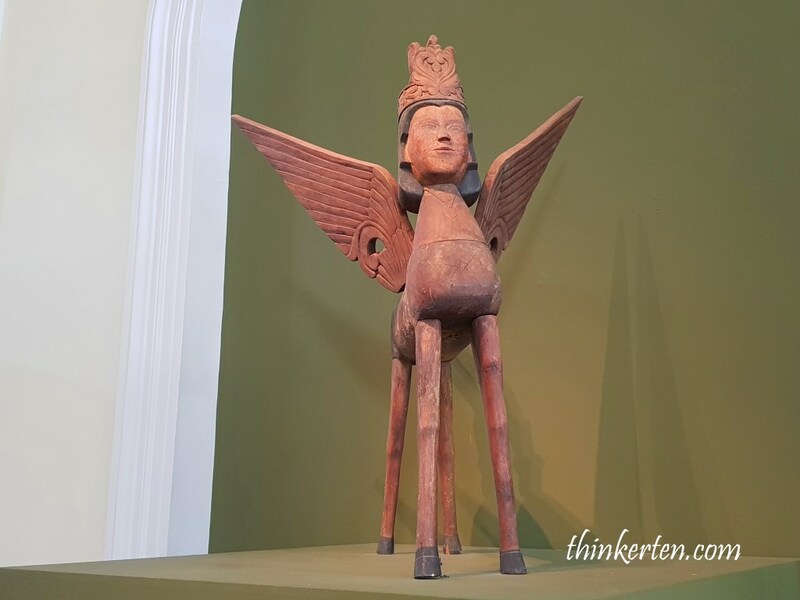 This half mule, half dongkey with wings is often refer as Buraq. It is normally animal with a human face. This is an Islamic mythology, a creature from heaven. 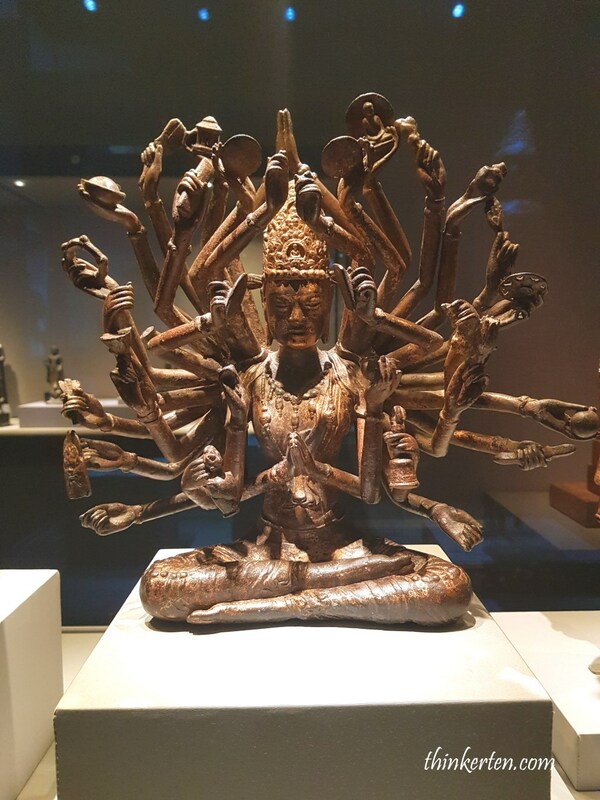 There are in total 34 arms of this Buddha statue. Dali is in Yunnan, which is just adjacent region of Thailand, Laos and Vietnam. 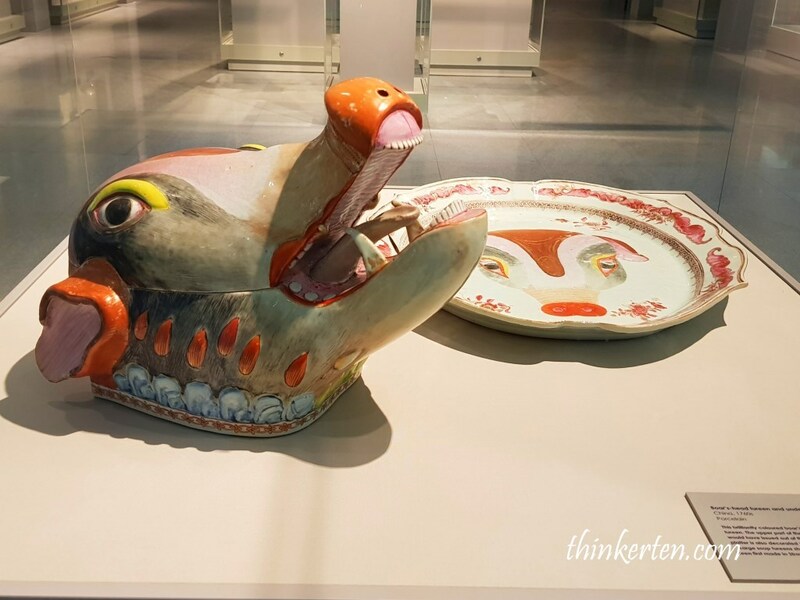 Not sure you found any similarity of the arts of Dali with its neighboring countries? 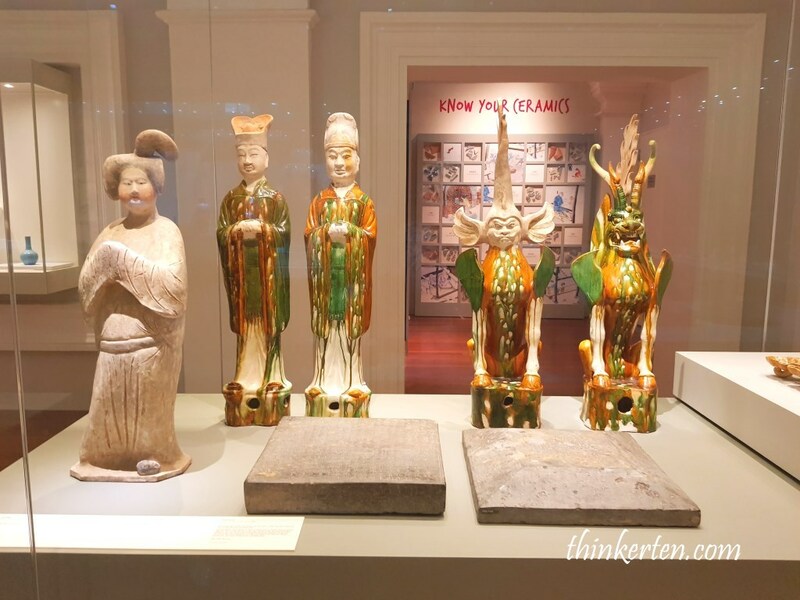 Most of the artifacts in Asian Civilization Museum are porcelain, if you love ceramics from different era, this is a good place for you to explore. 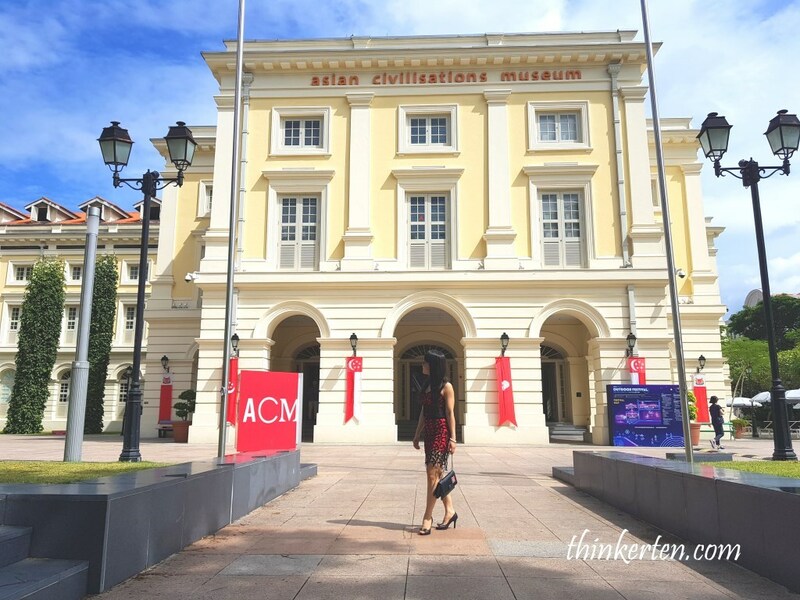 The museum is not that big, only 3 levels. It only took me an hour to complete the tour. 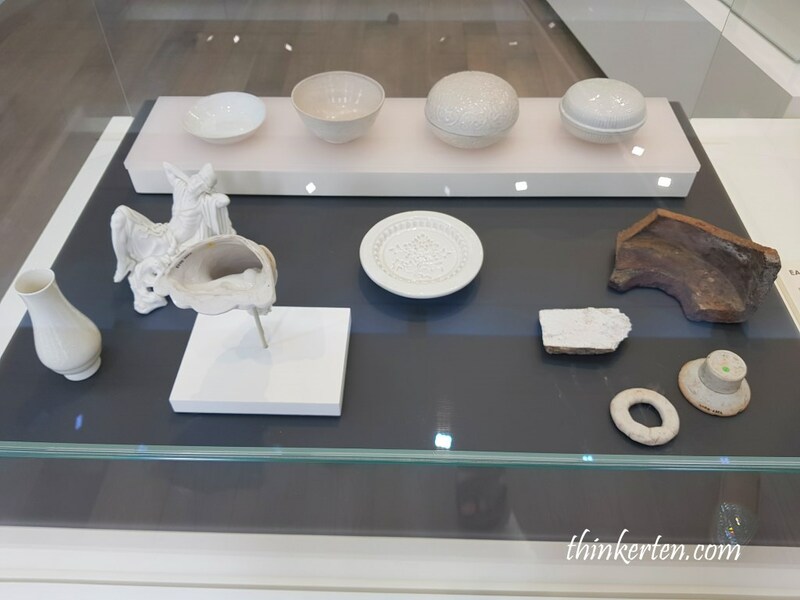 By looking at these artifacts, especially the porcelain, it gives me an idea of how people living in ancient civilizations. 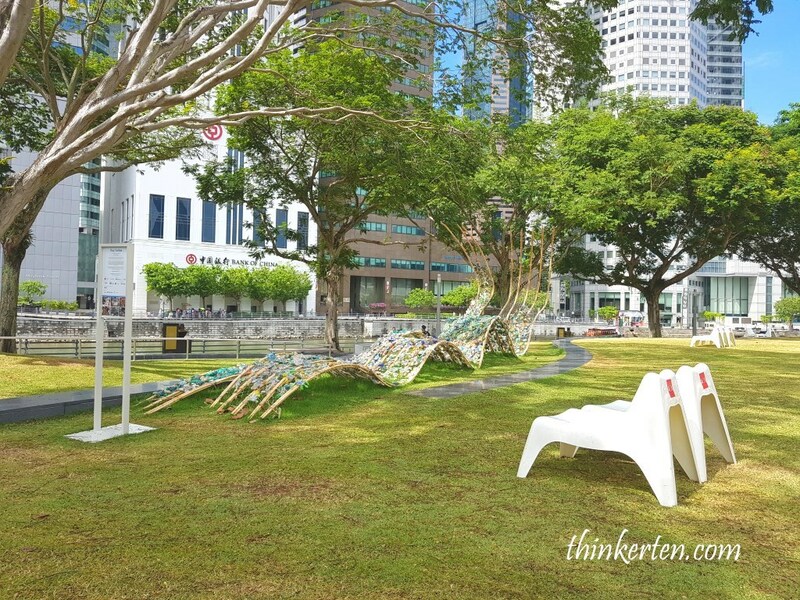 This temporary display of artwork is done by students from eight school in Singapore and Australia. It is for the civic district outdoor festival. Need a mirror? 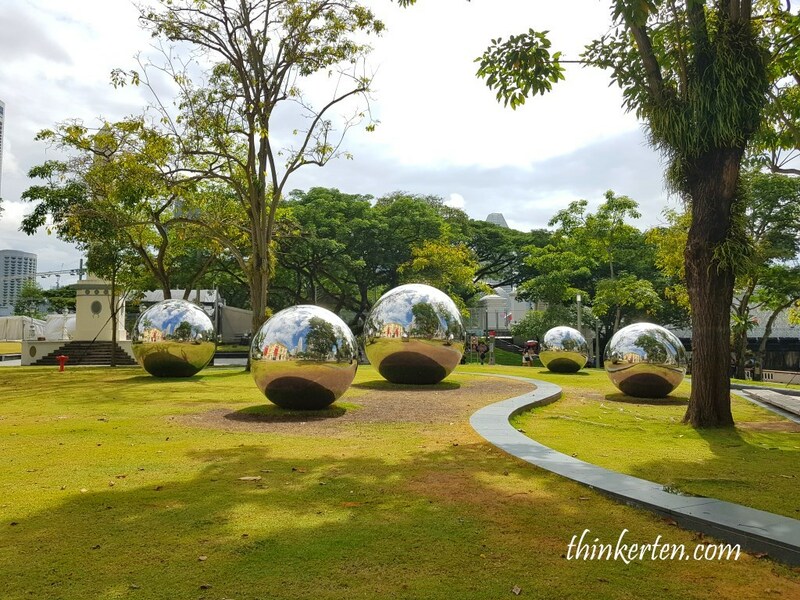 Check out the reflection of these giant steel balls. 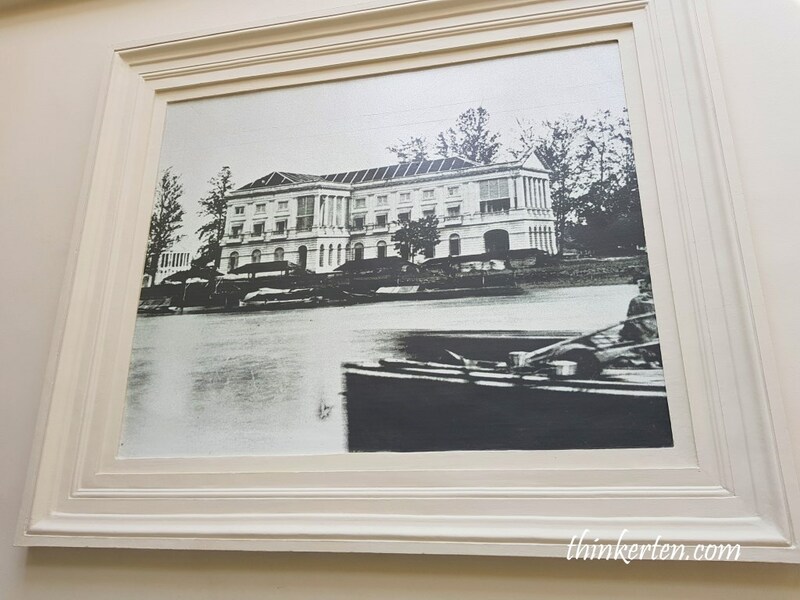 The ACM building is completed in 1867 and had originally been planned to be used as a courthouse but instead functioned as government offices until the late 1980s. Gazetted as a national monument on 14 February 1992. 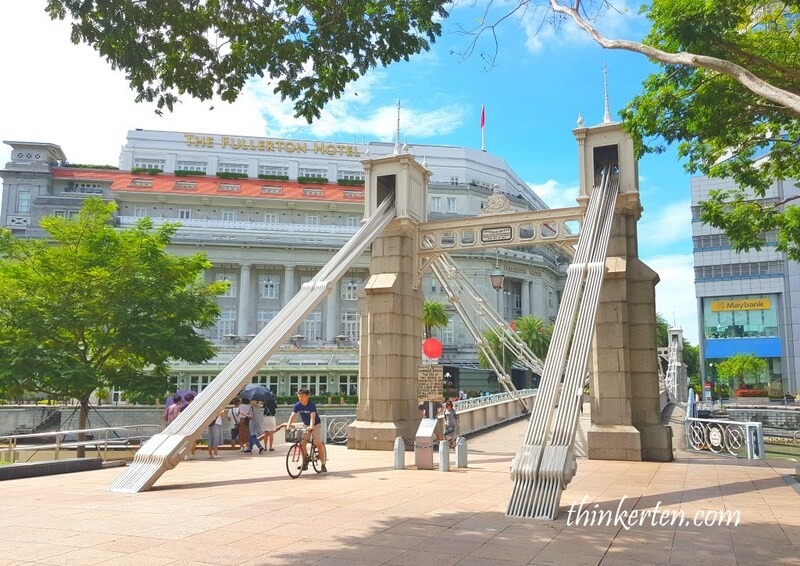 If you cross the pedestrian bridge also known as Cavenagh Bridge, it will bring you to one of the most prestigious hotel – The Fullerton Hotel, used to be an old post office building. You can also hop on the cruise just outside the ASM. 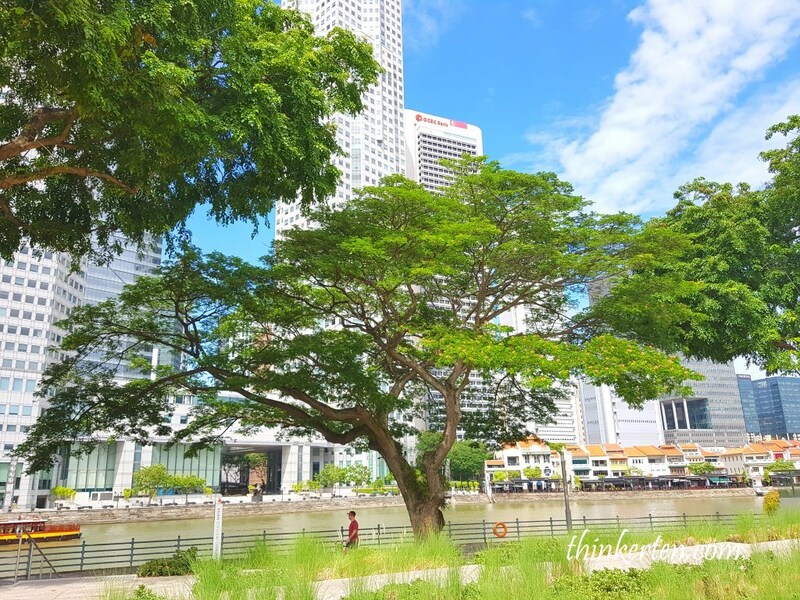 It bring you to sail along Singapore River overlooking many important monuments and iconic landmarks. 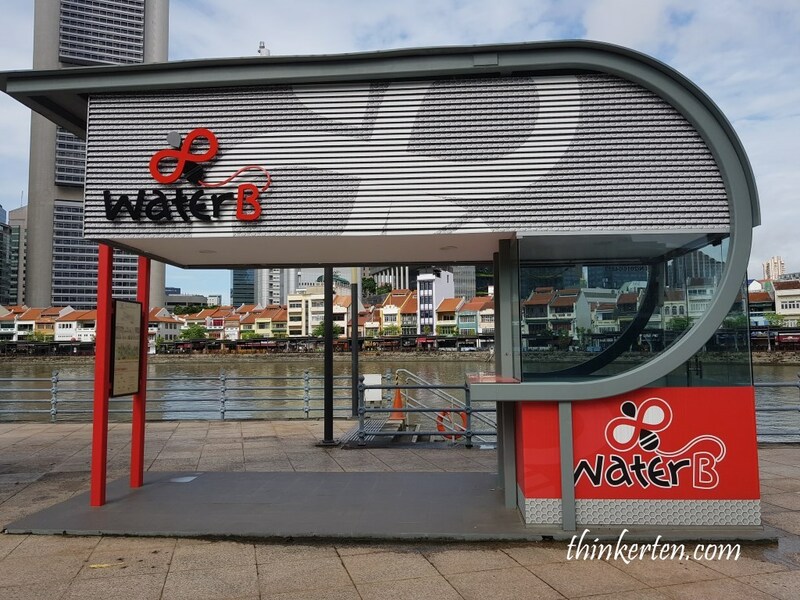 Click here to purchase ticket for WaterB Cruise! 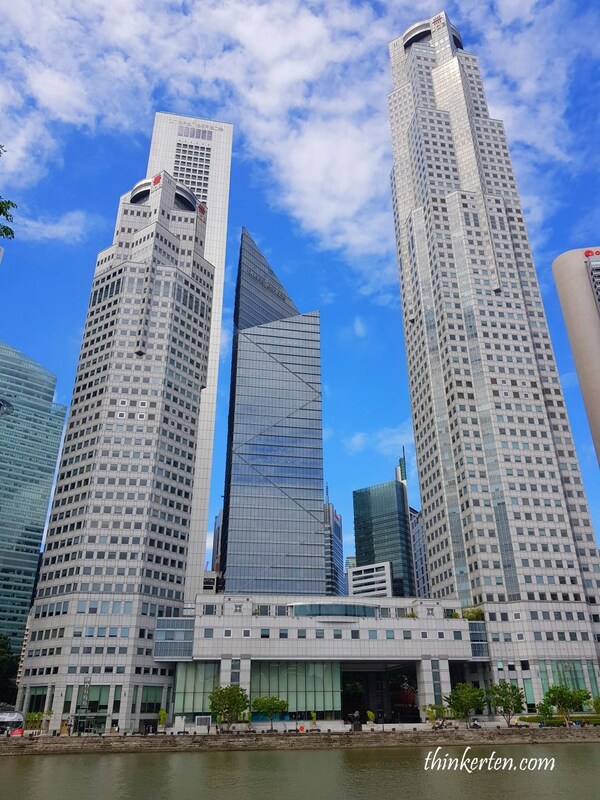 Some Skyscrapers along Singapore River. 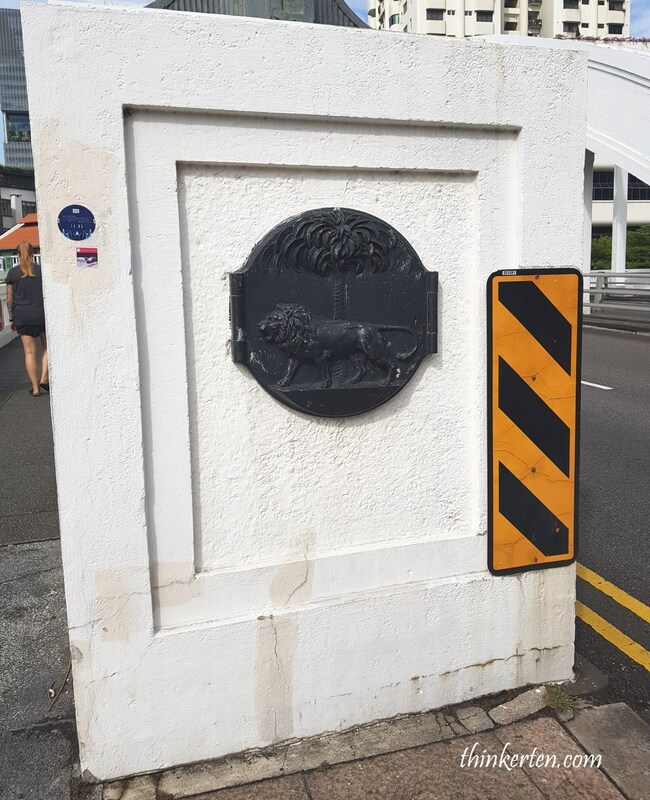 The bridge was built in 1929 and also the first bridge across the Singapore River. 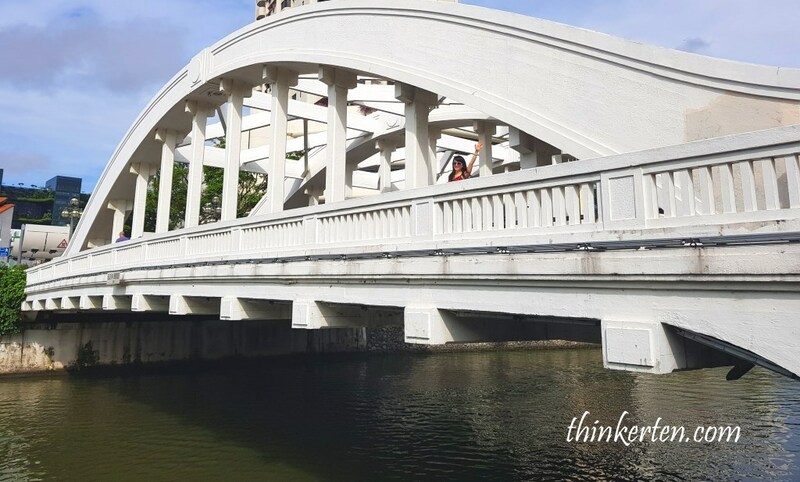 This is a two way motorway bridge and named after a governor – Lord Elgin. China : Dali in Yunnan, dominated by Bai Minority People!